If you have been reading my blog for a while, you know that I love my Gitzo Traveler GT1541T. It’s 6x carbon fiber, under 3-pound, folds to 17-inches (with head) and supports almost 18-pounds. But, at almost $1000, this combo is not for everyone. How does getting a very similar tripod (with head) for only $399 sound? It’s even more compact too! There are so many things to love about this Oben tripod. It folds much more compact than my Gitzo. If you notice in the first photo, my Gitzo tripod does not folder very compactly. The compact head that Gitzo recommends for the GT-1541T does not support enough weight which is why I use the Gitzo GH1780QR. And, you would think after spending almost $1000 on this combo, Gitzo would include things like a good travel case and leg spikes. Well, Oben does! And, it costs $600 less than the Gitzo. The Oben is very sturdy and well built. It handled my Canon 7D with BG-E7 Battery Grip and a variety of lenses including the big Sigma 50-500mm lens. The included tripod head has a bubble level under the arca-swiss compatible plate. And, this quick-release plate has a built-in screw handle like the Manfrotto heads, making it easier to secure and remove. It’s a great tripod! Want something even a little more compact? The smaller Oben CT-3500 folds to under 13-inches, weights only 2.5-pounds and will support 12-pounds. Unfortunately, this little gem is back-ordered until September. But, it shows the diversity in the Oben tripod line of over 20 tripods. If you are looking for a quality carbon fiber tripod that will last for years without spending a bundle, take a look at the Oben CT-3510. You will want to carry this tripod! One thing I LOVE about my Gitzo is the Anti-Rotational Leg (ALR) system. How does the Oben fair in that regard? 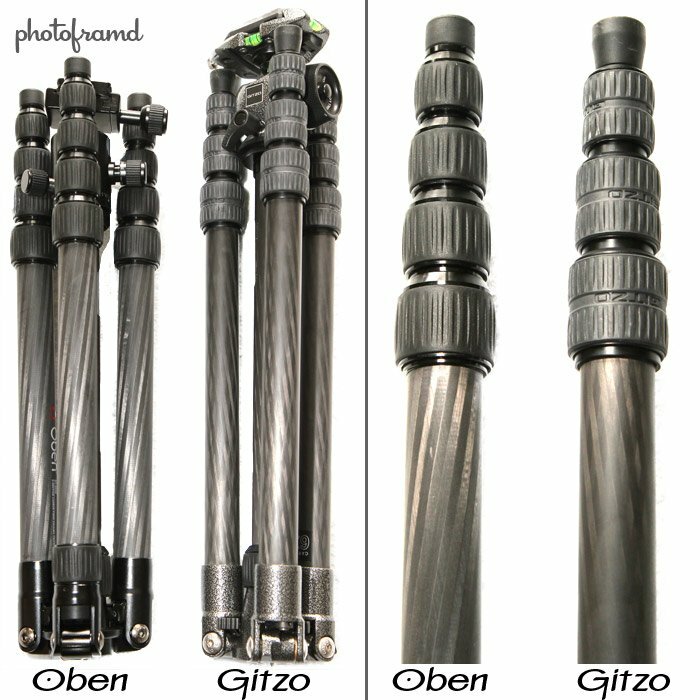 Oben does not rotate either making tightening and loosening their legs just as quick as the Gitzo. It’s a very impressive tripod. If I did not already own my Gitzo, I would have a very hard time to justifying buying the Gitzo over the Oben. It really is a bargain! I like to shoot a lot of slow shutter frames – on streets, beaches etc. Are you comfortable with the stability of this tripod that you would say that it would hold up for all these types of shots? Yes, it is a very sturdy tripod. It’s a little more compact than my Gitzo and costs much less. I recently obtained the Oben CT-3500 and realized that it’s not always necessary to turn the center column for low level shooting, just keep the legs reversed. They don’t lock, but it’s often not necessary. Good for quick low level shot.